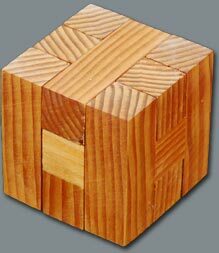 I originally started making interlocking puzzles for my nieces and nephews. I added sequential movement puzzle boxes after this so they could put something inside. The idea of actually designing a puzzle sequence based on a phrase started with simple puzzles I made for various friends and relatives where their name or names (if they were a couple) became the solution phrase for the puzzle. I have made custom puzzles for people who want them for friends and relatives where the solution phrase has a special meaning. 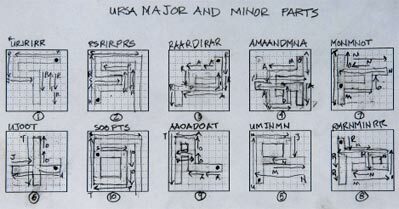 The diagram to the right shows the groove pattern that is cut into the movable pieces of a puzzle for it to have the solution phrase "URSA MAJOR AND MINOR PARTS". This is for a 22 move puzzle.